It’s often best to put things away until you need them. Navigation menus are a good example. If I’m reading an article, I don’t want a large proportion of screen real estate taken with links — especially on a mobile device. It must use clean semantic HTML5 with no superfluous tags. It must not require additional graphics. It must work on mobile and tablet touch devices. 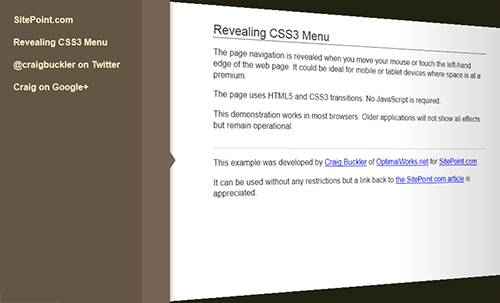 It must degrade gracefully in older browsers (IE7+) or when specific CSS3 properties are not supported. We’ve also defined the transform-origin to the middle of the left-hand edge. Even though the transform doesn’t occur until hover, Chrome becomes upset if we attempt to set the origin in the :hover styles. The element is fixed as a zero-width block on the right-hand edge of the screen which is resized when the menu slides out. Note the pointer-events property — I said it would come in useful! An that’s it. Even with vendor prefixes, the return on coding investment is far higher than you’d expect. The page shadow appears instantly rather than expanding over time in Chrome and Safari (webkit does not support pseudo element animation). Opera does not support the 3D page transforms — the menu slides out over the page. IE does not support transform so the menu covers the page. Few of the effects are shown in IE7 and 8, but the menu can be used. Mobile browsers such as Android, Dolphin and Firefox Mobile work well although performance might be an issue on slower devices. Let me know if you apply similar effects to your site. And if you enjoyed reading this post, you’ll love Learnable; the place to learn fresh skills and techniques from the masters. Members get instant access to all of SitePoint’s ebooks and interactive online courses, like Learn CSS3.